Advertising agencies have only ever been involved in the actual sales up to the display time, leaving the main part of selling to someone else - Free Advertising changes that by increasing the pie for the Marketers. - that initial display ignites the reaction from the Global Crowd in real time, the viral effect takes over and spreads products or services for sale on a world wide journey that can be tracked by advertisers and medium groups to see real-time results. The results can be monitored to see if another alert exposure is needed or see the results have hit the target, and if they have, the next advertising campaign can fill the vacancy in the media slots without missing a beat. This is real-time advertising that can display with minimal effort to a Opt-in audience, and Marketers get paid for the results! Subliminal Organic Advertising is the main distribution of QwickPics without making noise with displaying ads. It gives Marketing Agents a new income model that is 'paid on performance' - for every item ( unit ) sold through each exclusive campaign - 2.5% of the products or service's full Selling Price is earned by the agent. The percentage earned by Marketing Agents is generated by the backend economics process and not from Seller margins. QwickPic disrupts the middleman in advertising but what it does is fully digitizes and embeds advertising into global commerce so it's much more productive, rather than being an expensive 'fashion accessory' that tags along for the ride. - it does it using OutSell and Price Demand to market and guarantee items are sold. Advertising from mail drops to newspapers, television and even radio have been to simply expose the Seller's offer and get paid a set amount according to what audience exposure there is, then get the money for that display - leaving the problem with the Seller to get sales. There are few advertisements in any medium that don't have products or services with discounts to get the attention of potential Buyers. That attention grabber is the discount, so not only does the Seller lose the discount value, they still have to pay for the advertising. - with that speed, it sometimes comes down to which Seller is going to be first to remove the discount? Discounting merely moves the pendulum back and forth between which seller will blink first, many will say this is the free market but this is all at a cost to both the Seller and all their employees, and the overall economy that misses out on the taxes etc from full selling prices. - and it gives Publishers as in medium groups a new approach to offering advertising to the Seller. Marketing Groups ( Advertising Agents ) can be part of the 'sale event' and get paid 2.5% on the success of every sales at full selling prices, in real time - they can become part of the solution rather than continue to be part of the dilemma! Cloud Commerce disrupts discounting by 'selling high and buying low'! Changing the advertising model gets better revenue streams for medium outlets! Advertising is one of the few industries if not the only major industry that gets paid for providing an incomplete service for a client, incomplete as giving a service that has no genuine guarantee of results! 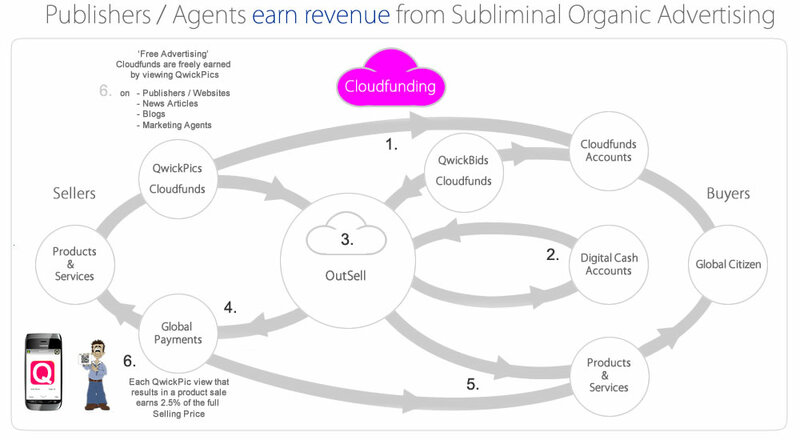 The Platform's QwickPic model disrupts that current spin doctor approach and completes the full process of exposing and selling the product or service with absolute real time results with no cost to a business without results. 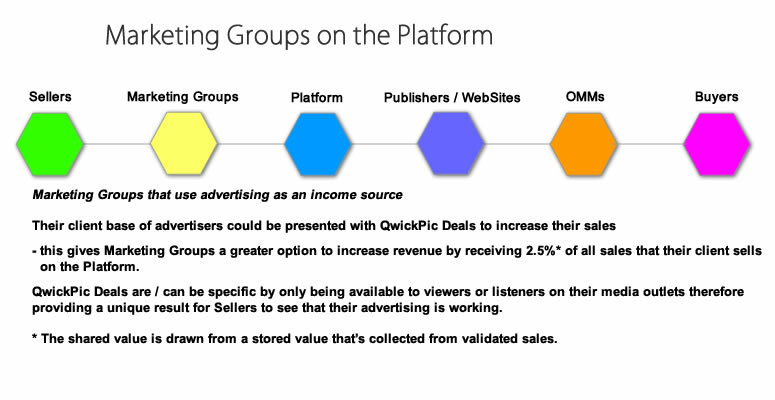 With QwickPic the medium that offers advertising as their source of revenue can be more specific with clients that have specific amounts of inventory that a business wants to sell, it's easy with QwickPic for a business to tell a medium group their target of sales. - but unlike traditional advertising the exposure is only done until all the inventory is sold, there's no advertising budget that needs to be 'spent', because there's none to start with, only the amount of inventory and once that set objective has been met then there's no need to utilize more valuable time or display area, this allows the medium to move on to the next advertiser's supply. From the time an item is released on QwickPic the process finds a virtual buyer that guarantees the item's value is in escrow before that the low buying price is available for the business to release to their local buyers with an incentive of a 20% maximum buying price. The change in the advertising model's dynamics is that the medium working for the business to sell inventory gets a percentage of the sales instead of a payment just for displaying an item, there's no information that's disclosed that's not already known to the medium like the item's full price, the only change is that there's a specific target of items to sell. Now the medium group can get a slice of the action with 2.5% of all the inventory sold specific to the campaign. - it only needs one ( 1 ) viewer, reader or listener to send out alerts to their network and the viral flow begins. - the process begins on the Platform and virally alerts a global Social layer of Buyers that completes the selling process ready for a local Buyer to purchase at the final discounted price of 20% or less of the List Price. Local buyers have equal opportunity to win the Deal with the mechanism being equally fair for each party - regardless who wins the Deal a Seller's 'local Buyer' will always be the final Buyer. The media owns the news copy on the Platform and owns the income generated from the 'news alert displays', according to whether they used the Platform's Seller alerts or added their own cliental base Sellers, in which case they earn 2.5% of any product or service that's directly purchased from the link. - or a user could be offered another option of sending QwickAlerts to the '6 Levels of connections' and not use the payment option. - we solve that by giving buyers the incentive to buy!